We’d love your help. Let us know what’s wrong with this preview of Reign of Ice by L.P. Dover. The scroll has been found and now the fae know how to defeat the dark sorcerer, to end his evil existence in the Land of the Fae. However, the only thing standing in the way is the one bond that must be formed; the one that will empower all four courts together and make them invincible. Ariella and B Two courts to four is what needs to be … to save the land so shall we see. The scroll has been found and now the fae know how to defeat the dark sorcerer, to end his evil existence in the Land of the Fae. However, the only thing standing in the way is the one bond that must be formed; the one that will empower all four courts together and make them invincible. Ariella and Brayden’s bond will not come easily, for Ariella is mischievous and head-strong with a heart full of love, while Brayden is strong and loyal with a heart made of ice. What do you do when the fate of your land rests upon your shoulders because of the bond you must form to save it? How are you supposed to do that when the one man to help you fulfill the prophecy is the one who doesn’t believe in love? To ask other readers questions about Reign of Ice, please sign up. I can't seem to find the series you mentioned coming in 2014 the land on the Fae? When is the next book of the series coming out? “I need to hear you say it, Brayden,” I murmured tenderly. Ok I know I went a little over board with my favorite lines but, OMG this was the perfect ending to a FAE FABULOUS series! Ariella is the last princess of the prophecy and she is mated to Brayden, who is a prince of winter and really guards his feelings and his heart! When he finds out they are mated he leaves her standing in the middle of everyone without another word. Ariella is so embarrassed and heart broken but, she will do whatever needs to be done to save the land of Fae from that crazy creep the Dark Sorcerer! Even binding herself to someone who has no emotion or feelings. Eecckkk I want to blast it from the rooftops what happens but, I won't because you have got to read this! L.P. Dover as always gave me everything I want and need to make a story perfect! I read it in 2 hrs. Once I started I could do nothing else, no one could get my attention and I loved every page! I'm also sooo thrilled she will be doing a spinoff! I am praying for a series! Thank you for writing an amazing 4 part series! She ended it beautifully! Holy wow this book was amazing! I couldn't have asked for a better end to this series. If it's possible, this was better than the other three. The one thing I really loved and appreciated about this one is how Ms. Dover brought all the characters together, and each had their own role to play, but the book still focused on Ariella. You are quickly swept back into the world of Fae; a world filled with such amazing detail that the scenes jump right off the page. Ms. Dover sucked me into this series Holy wow this book was amazing! I couldn't have asked for a better end to this series. If it's possible, this was better than the other three. The one thing I really loved and appreciated about this one is how Ms. Dover brought all the characters together, and each had their own role to play, but the book still focused on Ariella. You are quickly swept back into the world of Fae; a world filled with such amazing detail that the scenes jump right off the page. Ms. Dover sucked me into this series with her great writing in Forever Fae, but her writing is even more amazing in this one. She has a true talent for writing,and I can't wait to see what she writes next. The characters, Ariella and Brayden, are awesome. Ariella was a strong, brave female lead, but also extremely relatable. I loved that she didn't back down from a challenge, and that she never gave up. She found her own solutions to the problems that are plaguing the Fae world, and fought until the very end. I quickly fell in love with Brayden, and there was something more with his character in this one. I don't exactly know what it was, but I felt his character had more depth and was more relatable than the other men in this series. This was written in dual POV, but it's mostly from Ariella's perspective. I did wish there were a couple more chapters from Brayden's POV because I really loved his character, but I absolutely loved Ariella's POV. The action in this book was non-stop, and expertly written. We were left guessing until the very end of what would happen, and at one point I was literally freaking out. But don't worry because Ms. Dover makes everything work out in the end. My heart was breaking, but was quickly mended. The ending was beautiful, and even though this was the last of this series, it's not the last time we'll visit the Fae world. That's right...there's a spin-off series!!! So even though we're saying goodbye to these characters, we have much more to look forward to. Out of every single gift in the world, love was the most powerful. I just wished it was strong enough to save the Land of the Fae. I love all the couples, from all four books for diff 5 magical stars! I love all the couples, from all four books for different reasons. Ariella and Brayden just go so well together. They are the youngest of the Four. Brayden at the beginning is very shy, and isn't someone that shows his feelings and emotions and doesn't talk about them. Ariella has always been a prankster and likes to have fun. At first, she just wanted to be with Brayden so they could defeat the sorcerer, but over time they both start getting really strong feelings for each other. And my FAVORITE thing in the whole book, that makes it so much more different than the others in this series, is *SPOILER ALERT* Brayden becomes Ariella's guardian. And that just made me love their relationship even more!!! I have to say that L.P. Dover knows how to end a series! Each book in this series was better then the first.... I have to say I loved watching this series grow and come to a complete circle. This is my favorite book in the Fea series! The connection with Brayden and Ariella how it started with such tension and dislike for each other yet they had the connection, the bond, the Vision. I loved these characters the best I think, they were so unlike the others with their connection, fighting the inevi I have to say that L.P. Dover knows how to end a series! Each book in this series was better then the first.... I have to say I loved watching this series grow and come to a complete circle. This is my favorite book in the Fea series! The connection with Brayden and Ariella how it started with such tension and dislike for each other yet they had the connection, the bond, the Vision. I loved these characters the best I think, they were so unlike the others with their connection, fighting the inevitable. This story was different the the others and I think just perfect. L.P took us on an adventure through the land of the Fea and and added elements that just made this the most unique of the series. Brayden and Ariella both strong willed characters were just perfect for each other. I so enjoyed watching their lives and relationship grow in this story. I Love how L.P. knows how to paint a picture with her words to make it feel like you are in the land of the Fea with her and her characters. I could picture myself standing in the Winter Ice land and seeing it sparkle from the sunlight shining on the ice. All of the characters from the first three stories are together for the four and final book. Ariella and Brayden overcome stubbornness, pride and immaturity to complete and create the final court. This challenge doesn't come easy and puts many lives in danger, claiming others. The Ariella and Brayden that open this story are not the same Ariella and Brayden that end it. Their transformation and growth is significant. The author of this book said it was her favorite of the four and I absolutely a All of the characters from the first three stories are together for the four and final book. Ariella and Brayden overcome stubbornness, pride and immaturity to complete and create the final court. This challenge doesn't come easy and puts many lives in danger, claiming others. The Ariella and Brayden that open this story are not the same Ariella and Brayden that end it. Their transformation and growth is significant. The author of this book said it was her favorite of the four and I absolutely agree. I thoroughly enjoyed all four books but this one definitely takes the cake. I have to give her major kudos for her writing style and plot. I was highly entertained the entire extent of this story. Her characters were strong and likable. Reign of Ice. Ah, what can I say. This book is my favorite. I absolutely loved them all, but hands down, this one takes the cake. L.P. Dover’s writing is top notch. This story line is so well thought out and planned, and it makes for a gripping ride that definitely left me on the edge of my seat and holding a box of tissues at the same time. I definitely love the chemistry between Ariella and Brayden because these two definitely give each other a run for their money. They are stubborn, independent, but somehow, they have to find a way to come together, for the sake of their land. That’s a very hard thing to do when Brayden has no interest in being in love, he truly is the ice in this story, but Ariella can definitely be cold too. They have surely become my favorite Fae couple. I cannot wait to see where L.P. takes the series next. The end of this Fae series opens so many more doors and more magic is sure to be waiting for us on the other side of them. If you are looking for a great series, start with Forever Fae and continue on. You will not be disappointed! This book shows the love, strength and unity they have that is needed in order to rid the dark sorcerer and his evil. I love this series and I loved this book! I loved how different Brayden and Ariella seemed to be at the beginning, when in reality they were perfect for one another. I enjoyed the camaraderie between all the court leaders and other important fae players, like Elvena. You can feel the love they all have for one another and their determination to protect each other and their people and land. But with the camaraderie, love and determination, you can also feel the tension and fear that is hanging ov I love this series and I loved this book! I loved how different Brayden and Ariella seemed to be at the beginning, when in reality they were perfect for one another. I enjoyed the camaraderie between all the court leaders and other important fae players, like Elvena. You can feel the love they all have for one another and their determination to protect each other and their people and land. But with the camaraderie, love and determination, you can also feel the tension and fear that is hanging over them all because of the impending war with the dark sorcerer. I thought Dover did a good job of tying up the loose ends and giving the story a good ending, but leaving it open-ended enough for the new spinoff series. I didn't feel cheated out of answers like some series endings that I have read in the past. There were also a couple of twists that I didn't see coming that I enjoyed. well everyone...this was the last of the Fae series. I am saddened to say goodbye to them. I do hope for more somewhere....lol. I must say that THIS one as awesome as the first 3 were, THIS was my favorite book of all. Ariella must finish this once and for all. She has powers she needs to come into. However Alasdair is a tricky one. Can Ariella do it? Or will she have to sacrifice lives? Maybe Alasdair finally has the weapon well everyone...this was the last of the Fae series. I am saddened to say goodbye to them. I do hope for more somewhere....lol. I cried. Like snot on sleeve type of cry. An unpretty cry of all sorts. Miss Dover: you have captured my heart from the first book and you shattered it along the way, mended it back together, just to shatter it all over again. This is by far my favorite out of all the Forever Fae books! Ariella is stubborn and funny as hell. Brayden starts out stubborn as well but he gets better (I was ready to hit him in the head with a frying pan in the beginning) Perfect ending to the series & it's one that I know will be in my Top 5 favorite books of all time!!! LP Dover's writing gets better and better with each book she releases. Now we just need Forever Fae movies (only if L.P. gets to Amazing! Fantastic! Awesome! Perfect! This is absolutely my favourite of the series. (Move over Summer of Frost lol, though I do still love ya!) The writing has just gotten better and better, and the character's more colourful and endearing. I love Ariella and Bray, and the twist on their personal story. I love how we get history of the motherly feud. I love the sass and the bull headedness. I just purely enjoyed the closure to this series, it was a fun (and sometimes cheeky) ride. Thank you for letting me read! I received Just, yes! I have loved L. P. Dovers books since the first one that I have read. Reign of Ice is one of her best so far. It moved along at a great pace, from beginning to end, I finished it in one sitting and needed more. The characters are amazing and the story is awesome. L. P. Dover has created an amazing world, that once you enter you have an extremely hard time leaving. I am looking forward to reading more from this fantastic author in the future. I was lucky and recieved an arc of this book. I was already in love with this series but this book just added to it. I these were my favorite charators though. Areilla reminds me a lot of myself. She is stubborn and determined and when she gets something in her head back up because there is no stopping her. She is so brave and loves her people. While reading this book all I kept thinking was I want to be a part of thier land. I can't wait to read the spin of series for this book. AMAZING!!!! I loved this book and the whole series! I'm sooooo sad to see this series end, but luckily, there a spinoff next Spring!! Yay! The only complaint for me about Reign of Ice, is that I wanted to see more of Brayden. I love books that have different P.O.V.'s!! I mostly read about Ariella but not that much about Brayden. But any who, THIS BOOK IS BEAUTIFUL AND IS SOOOOOO WORTH THE READ!!!!! Love ya Mrs. Dover! If I could rate more than 5 stars, then I totally would!!!!! I was given this book in exchange for an honest review for LoP. A great ending to amazing series. Ariella is the summer princess her twenty-first birthday. On her twenty-first birthday she get's a guardian the winter prince Brayden. He has a hard time expressing himself to Ariella. After they are bonded they had easier time saying what's on their mine. Ariella runs away to face the dark sorcerer. I love how strong Ariella is in this book. 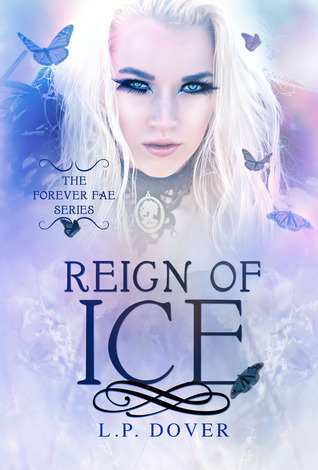 Reign of ice was by far my fave of the Forever Fae series! I love Brayden and Ariella's relationship! I could not put it down! Even though there wasn't a lot of emphasis on the killing of the Dark Sorcerer, I almost missed it, the ending was perfect and had a great lead up to the new spin off series! Can't wait for the Land of the Fae! Brayden and Ariella have the most beautiful love story in the last book. When reading it you could truly feel the characters emotions. I was sad to see the book ends, but the ending was more than I could of hope for. Amazing series and definitely one of my favorites!!! A wonderful series that I throughly enjoyed! A great conclusion to a great series. As I close this chapter on The Land of Fae, it brings a smile to my face how this series ended with Reign of Ice. This series has been one of my favorites in the past year and I couldn't be happier with how everything went. This final story with Ariella and Brayden, the youngest of all the 8 Princes and Princesses, was fraught with the same passion and zeal I have come to expect in this series, while bringing to the table their own unique story. They cap a beautifully written series that is both As I close this chapter on The Land of Fae, it brings a smile to my face how this series ended with Reign of Ice. This series has been one of my favorites in the past year and I couldn't be happier with how everything went. This final story with Ariella and Brayden, the youngest of all the 8 Princes and Princesses, was fraught with the same passion and zeal I have come to expect in this series, while bringing to the table their own unique story. They cap a beautifully written series that is both awe-inspiring in its' landscape and compelling with its' characters. Reign of Ice should be on your TBR list, immediately. First off, Ariella and Brayden. They are adorable together. You have this spit-fire of a girl, who doesn't take crap from anyone, including her Prince and then this quiet, reserved and serious guy who quite frankly seems a little bit shy to put it plainly. She follows the tradition of the women in her family by being a strong female but she is more on the mischievous side of confident and I thought that personality balanced with what she had to sacrifice for the good of everyone. Fun and playful grew up into someone who made the decision that had to be made, regardless of what others think about them. I think that trend of growth was also evident in Brayden as well because you had this seemingly cold character that blossomed into a swoon-worthy Prince throughout the story and as a direct result of Ariella's aura. The story itself did seem a bit rushed at first. However, I can overlook that simply because there was a lot to do in this book to reach an end that could be complete. I would have loved to get to know these two more and have a chance to flush out some of there relationships with other people, like we did in the first three books, but it was still there in small bits. The setting in which these characters reside is always a positive in this series and that continues in Reign of Ice. Everything is so detail oriented, right down to the white sand stones of their Winter Palace to the gorgeous detailing in her wedding dress that seem to come alive right on the page. The details embedded in these stories are amazing. Plus, I am thoroughly in debt to the author for making this an actual ending. There are always going to be hints of the possibility of more stories coming from The Land of Fae but it had a decisive finale, and I love that. The series as a whole has been a breathe of fresh air for me in a very much written about category of fae. I have to say that the growth you read about in all four of these books with the characters is equally matched in the growth of the writing. L.P. Dover has done a brilliant job of creating four individual stories that make up the greater whole and that is something that should be applauded. It could have been so easy to churn out four love stories that were all the same and have a monotonous pattern emerge. Not the case here. You can tell from page one of Forever Fae to the last page of Reign of Ice that her writing has grown and developed an adept feeling for telling you the reader about her characters. Oh. My. Gawd! I absolutely positively love, love, loved this book! Wow, just wow! I think that Arielle and Brayden are by far my favorite part of the series besides Ryder that is. (Heehee) I thought Mel was a tough chick but Ariella just had a way about her and she definitely was the most headstrong of the bunch. Brayden took warming up to but it got plenty toasty after that. I was so on edge reading the book from the very beginning always dreading when Alasdair would make his move and I have to Oh. My. Gawd! I absolutely positively love, love, loved this book! Wow, just wow! I think that Arielle and Brayden are by far my favorite part of the series besides Ryder that is. (Heehee) I thought Mel was a tough chick but Ariella just had a way about her and she definitely was the most headstrong of the bunch. Brayden took warming up to but it got plenty toasty after that. I was so on edge reading the book from the very beginning always dreading when Alasdair would make his move and I have to say I was shocked and he was very clever. I also like Ariella's powers the most and I love that this story delved more into the reasons why Queen Mab and Queen Tatiana loathed each other though I am sure there is more to the story. That was exciting! The first guardian and destined match of the bunch. There are so many things I loved about this story and Alasdair was not one of them although he is the perfect villain. I laughed and man did I cry. I cried more than once as a matter of fact. It was so hard to keep reading at one point but I had to know what happened next. Reign of Ice is a beautiful story filled with love, happiness, anger, good, evil, family, destiny and magic. The series will stay with me forever I am pretty sure. To love like that, a forever without any doubts bonded love, amazing. It's full of beauty as well as hot guys and steamy goodness that made me blush. I will more than likely read these books again and possibly again after that! I could seriously go on and on and in the end oh my god! No joke I read through streaming tears! Seriously! It was so heartbreaking to get pulled into Brayden's emotions. That part was definitely brutal. Oh and the end, wow! Meeting Ella, oh you just have to read it! It was amazing!!! I read it all in one day!!!!!! I absolutely love the series and if you love stories of Fae like I do and have no problem with the steamy bits this is most definitely a great series for you. I recommend it! Best NA Fantasy Romance Series EVER!! Overall: This book was a magical adventure ride ending to a wonderful, romance packed series. We've caught glimpses of Ariella and Brayden throughout the other 3 books and I was so happy to be able to finally get my hands on their tale. The story begins with wounded soldiers coming to the Summer Place because they were attacked. Ariella was right there to help out and when she found out Brayden was hurt, she rushed to him room and sang to him, just to find out that he was wake the whole time. They see each other again at the Ball and have their vision, but Brayden immediately leaves and leaves a hurt and humiliated Ariella in his wake. Now Ariella is the type to hold a grudge and she has mischief coming out of her pores, so when her 21 first birthday happens and she finds out that her new power is the ability to glamor herself into anyone she wants. As a way of apolgizing to Ariella, Brayden approaches her father to ask if he can fight to become her guardian and low and behold he ends up winning. That's when the real magic starts to happen. Brayden is the strong and silent type, where Ariella is the loud and fun type. To see their personalities come together was just wonderful. I don't want to say more about the story because you should just pick up the book and read it yourself, but let me tell you, it was INCREDIBLE. The ending was fantastic and i really liked how Miss Dover left things open for her new series. I can't wait to read them because i have a feelings its going to be about the sons and daughters of our 4 princesses. Series Cont: No. But a new series is in the works. I got this book from Lovers of Paranormal Group of Goodreads under the Read to Review theme. Well, the blurb gives just the right amount of info about the story line without giving out any spoiler so I’m not going into it and starting with my thoughts on this book. I completely loved the first 3 parts I got this book from the author, free of cost, in exchange of an honest review from my side. I completely loved the first 3 parts of The Forever Fae series and I was so excited to read this fourth instalment and let me tell you guys that the author did a fabulous job here and as this is the last novel in this series so somewhere I felt heartbroken that there wouldn’t be any next instalment to look forward to but the good news is that there will be a spin-off!!! The romance that the author portrayed in here is complicated yet passionate and the chemistry between Ariella and Brayden is swoon worthy and it just knocked me over. As always the steamy scenes are portrayed so brilliantly that it didn’t felt gross or I didn’t have to gag!!! There is action, adventure, suspense and a chilling surprise that will shock you as well as surprise you. The dark sorcerer will be defeated once and for all and all the four princesses will come together and merge their powers. I was at the edge of my seat the whole time and chewed my nails as well. The whole plot is great without any holes and the storyline is executed so well that I couldn’t point out even one error. I would recommend it to all the wonderful fantasy and fairy lovers and I know that you guys will love it as much as I did. Enjoy reading!!! I was given a copy of this book in exchange for an honest review for the Lovers of Paranormal goodreads.com group. Let me start off by saying that the only disappointing part of reviewing this book is that I can't give it even more than 5 stars! Wow, I don't even know where to begin with how much I loved this book and series. I cannot wait until 2014 when Land of the Fae spinoff is released! This is the 4th and final Forever Fae installment and this one focuses on Ariella, the Summer Court prince I was given a copy of this book in exchange for an honest review for the Lovers of Paranormal goodreads.com group. This is the 4th and final Forever Fae installment and this one focuses on Ariella, the Summer Court princess and Brayden, the Winter court Prince. It has been a long time since i've actually had my eyes well up with tears over a book but this one did just that. The raw emotions that the author is able to rip out of her readers is a rare gift indeed. This entire series is very well written, descriptive and the images in my mind are believable. I loved how Ariella & Brayden's story started out. I honestly didn't know what to expect from them from one page to the next! I'm fairly certain that Ariella is my favorite of The Four, with her wit, humor and stubborn determination. Of course, with each of the books I read, it felt like the newest couple was my favorite lol. I liked how this one incorporated more of the family and characters from the previous books. I couldn't have been happier with how this ended, even though i'm sad that I have to wait for the spin-off! Not only does she love to write, but she loves to play tennis, go on mountain hikes, white water rafting, and you can’t forget th New York Times and USA Today Bestselling author, L.P. Dover, is a southern belle residing in North Carolina along with her husband and two beautiful girls. Before she even began her literary journey she worked in Periodontics enjoying the wonderment of dental surgeries.